Welcome to a New Year of Pack 65 Scouting Fun! Welcome to the Pack 65 website. We always welcome new scouts. If you have any questions, or need to get in touch with Pack 65 please use the Contact Us link below. Please Contact Us with any questions about Cub Scouting with Pack 65. Boy Scout Troop 10 (located in Redwood City) would like to welcome any interested Webelos 1 & Webelos 2 boys to attend an open house at Edgewood Park in Redwood City. Regardless of if your son is trying to decide what troop he will bridge to or if he still has another year in Cub Scouts but is just generally curious about Scouting please come join us. This will be a chance to ask questions, learn a few Scouting skills, eat food and hopefully have some fun. 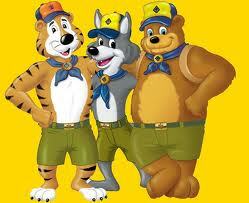 Weather permitting, we will take a nature hike, do some dutch oven cooking and teach some scouting basics (e.g. knot tying, putting up a tent, etc). Since we are going to be buying food to prepare, we would like a count of interested boys so we purchase appropriately. Please RSVP to Alex Schernig by 2/21 (details below). Blue and Gold Dinner - Don't miss it !! Skip cooking dinner on Sunday March 3rd and join us for the Annual Blue and Gold Dinner at the Elks Club in Redwood City. Taco bar, birthday cake, Cap'n Jack Spare Ribs magician, games, and awards. $15 per scout and children under 12, and $20 per adult. Siblings, friends, parents, & grandparents are all invited and welcome. Sign up on the pack website using paypal here or or send an email to signup@pac65.org. We need to finalize numbers soon, so dont miss out. Will you be the next committee chair ? Our current committee chair, Sharron Penn, will be leaving Pack 65 in March when her son bridges to Boy Scouts. Will you be the next committee chair ? Role includes liasing with Pacific Skyline Council, with our Chartering Organization (soon to be the Lions Club), and with the Mahany Hall, and processing applications from new scouts and new leaders. The role could be divided between two people, and the majority of the tasks can be done in the evenings by email etc. Please reach out to Sharron Penn or Dan Kalamaras if you are interested and/or want to hear more information. Thanks ! Thanks to all that were still able to collect food for Scouting for Food. It was still a great sucess with ten pallets of food collected, despite the event being cut back due to the poor air quality. We will also continue to collect donations at the next Pack Meeting on Monday November 26th. Thanks, the Pack 65 Leadership. If you were not able to pay your dues at the September pack meeting, you can pay on the website using PayPal. Select "Pay for Stuff" on the Menu bar. Thanks !